NGC 7320 (also known as PGC 69270) is an unbarred spiral dwarf galaxy of some 30 thousand light-years across, located about 39 million light-years away from Earth in the northern constellation of Pegasus (the Winged Horse). It is receding from us at roughly 786 kilometers per hour. Together with the galaxies NGC 7317, NGC 7318A, NGC 7318B, and NGC 7319 it forms Stephan’s Quintet (also known as Hickson Compact Group 92 and Arp 319), even though NGC 7320 is actually a foreground galaxy, and not a member of the galaxy group; which lies at some 300 million light-years distant. NGC 7320 is showing extensive star-forming (H II) regions, visible as as red blobs, where active star formation is occurring. The bright blue dots are young star clusters. 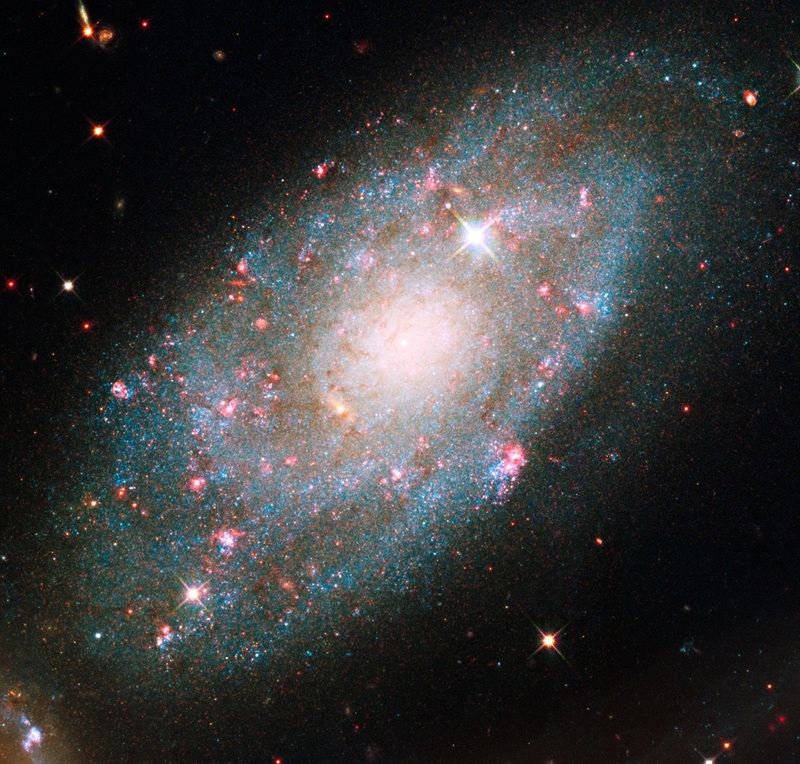 In this galaxy, Hubble can also resolve individual stars, evidence that NGC 7320 is closer to Earth than the other members of Stephan’s Quintet. The composite image was taken in visible and near-infrared light by the Wide Field Camera 3 (WFC3) aboard NASA’s Hubble Space Telescope, that observed the Stephan’s Quintet in July and August 2009. It was made by using filters that isolate light from the blue, green, and infrared portions of the spectrum, as well as emission from ionized hydrogen. These Hubble observations are part of the Hubble Servicing Mission 4 Early Release Observations. NASA astronauts installed the WFC3 camera during a servicing mission in May to upgrade and repair the 19-year-old Hubble telescope.